Every year in January, KBIS (the Kitchen and Bath Industry Show) takes place in Las Vegas, Nevada. The show always features the latest trends in appliances, materials and technology, and this year was full of exciting new offerings. Everything from black faucets with hot pink handles, to barnwood cabinets, to crystal filled knobs could be found. Building on the growing trend of creating the “Smart Home,” manufacturers from lock makers to appliance companies were promoting devices to control home automation and monitoring. Smartphone apps are used to connect consumers with various tasks within the home, saving them time, money, and sometimes, peace of mind. Aesthetics-wise there seemed to be an emergence of “rustic modern,” using natural earthy materials in new and exciting ways. Textured wallcoverings and tiles in amorphous shapes and angles created a contemporary look that bowed to mid-century modern roots. Cooktops featured heavy-duty metal grates in interesting patterns, and the introduction of brass burners created a great play between materials and finishes. Satin Nickel, Polished Nickel and Aged Bronze were a few of the highlighted materials. Also big this year were appliances that give users feedback – knobs that light up when in use and glow at various rates and intensities to show temperature ranges. 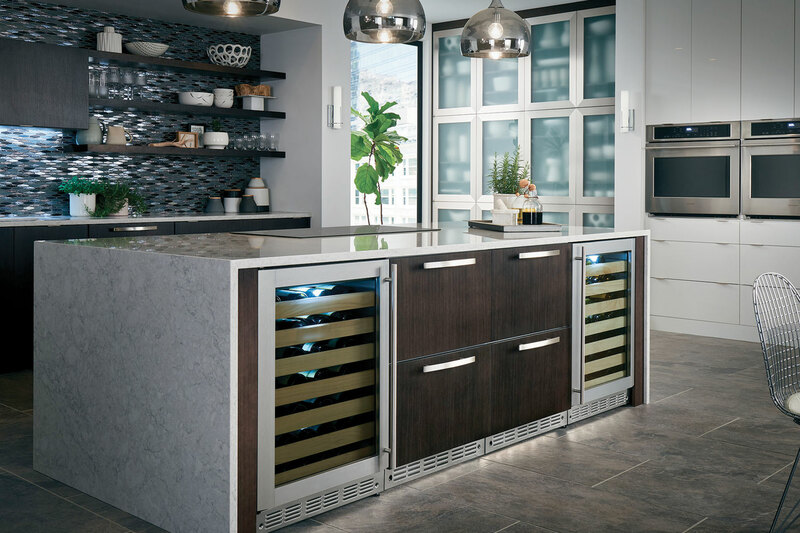 Overall, it showed that kitchen and bath technology is catching up with the latest in digital advances and designing them into beautiful environments.